.work is a GTLD that was proposed in ICANN's New gTLD Program.Top Level Domain Holdings is the successful applicant for .work. It was delegated to the Root Zone of the DNS on the 23rd September 2014, completing the successful application for the string. .work is a new generic top level domain targeting retail, construction and tech businesses as well as headhunters, job seekers, and other employment-related companies and services. .work was delegated to the Root Zone of the DNS on the 23rd September 2014, completing the successful application for the string. "We are confident that the .WORK top-level domain will give people seeking employment access to a safer, more efficient and effective job search process. It will also create transparency among businesses, encouraging them to provide living wages and treat employees well. 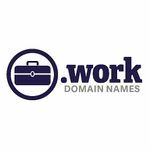 making domain names ending in .WORK available to all those who may want to use such .WORK domain names for their own business, personal, political or other legal purposes in the United States and world-wide. the promotion of employment by having information of any and all types and for any and all legal purposes available and disseminated from websites and email addresses ending in .WORK for the registrants’ and users’ own purposes world-wide. the promotion of employment by allowing businesses, not-for-profits and individuals to associate their products, services, information and selves with employment for their own purposes. allowing people and organizations to promote their association with employment on the Internet. providing an identifiable means for people, organizations and businesses to communicate with those who associate with or provide employment. On balance, and for the reasons set forth above, a .WORK domain will be in the public’s interest; it will serve as a catalyst to promoting employment; and it will benefit the entire economy." In October 2013 ICANN released their final assessment and mitigation plan for the Name Collision issue that was facing the New gTLD program. On 18 November 2013, ICANN announced the applied-for strings that were eligible for an alternative path towards delegation that would allow applicants to proceed without waiting for further mitigation research and plans to be published. 25 strings, including .work, were not eligible for the alternative path, and will have to wait for more plans to be published before continuing towards delegation. On 19 December 2013 Top Level Domain Holdings received a Registry Agreement signed by ICANN for .work after passing all the required processes needed to become a Registry Operator for the string. This page was last edited on 17 November 2017, at 22:52.